Now that it's officially patio season, many of us forget about the sunny afternoon pastime's much neglected poor cousin, the picnic. And yet, picnics offer much of the same: warm sun, good company, some food, some drink, and a 360 degree view of the world whizzing around you. But unlike patios, picnics build community and makes good use of shared public spaces. A picnicked park is a loved park, and more picnics makes life better for everybody. After the success of last year's epic picnic, I am happy to say that our picnic blanket has been thrown down five times this month, each time in a different park. 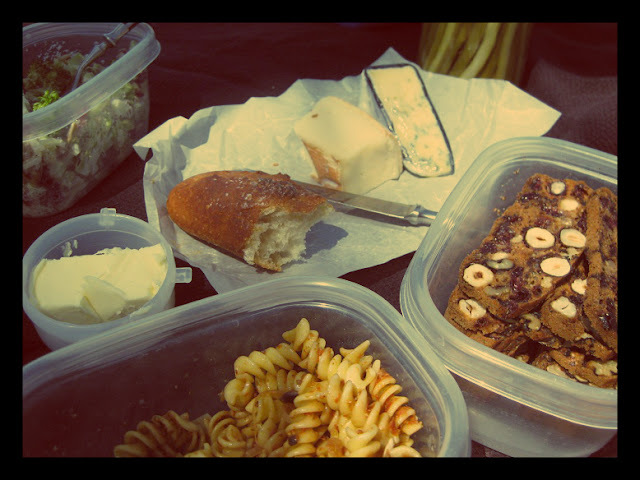 The best picnics had the right mix of people watching, cloud gazing, and good food. The strangest picnic was when we hunkered down in a small patch of green space on a dead-quiet Sunday in the financial district. Sitting among cigarette butts and sneaking beers sips away from security guards wasn't what we had in mind, but hey, sometimes you have to take what you can get. Sometimes I daydream about the perfect picnic meal. Right now, I'm thinking of build-your-own open-faced rye sandwiches, with a variety of cheeses, pickles, grilled vegetables, fresh herbs, sprouts, and homemade pestos. Perhaps a simple side salad of seasonal vegetables, an intermission of fruit-nut crisps and crackers, a summer fruit pie to finish, and a crisp bubbly to wash it all down. Then again, on a hot summer day, I might be just as happy with only a lemon popsicle and the shade of a large tree to keep me company. Adapted from Dinner with Julie. These dairy and egg-free crisps are great on their own, or alongside cheeses, dips, and antipasto. Feel free to use any or all dried fruits, nuts or seeds you prefer. Preheat oven to 350°F. Grease a 9x5" loaf pan with vegetable oil. In a small bowl, combine the almond milk and vinegar, and set aside. In a large bowl, mix together the flour, brown sugar, baking soda and salt. Fold in the milk mixture until barely combined. Add the cranberries, hazelnuts, walnuts and flax seeds, and stir until just blended. Pour the batter into the prepared loaf pan. Bake for about 35-40 minutes, until golden brown and a cake tester inserted into the centre comes out clean. Cool for 30 minutes in the pan, then carefully remove and cool on a wire rack. Once the loaf is completed cooled, double wrap tightly in plastic wrap, and freeze overnight. The next day, preheat oven to 300°F. Remove loaf from freezer, and use a sharp serrated knife to cut slices as thin as possible. Place slices in a single layer on a baking pan, and bake for 20 minutes. Remove from oven and turn each slice over. Bake for another 20 minutes, or until crisps are golden brown and crunchy hard. Cool completely before serving. The crisps will keep for at least a week in an airtight container.